Home page > Blogs > Quarto Explores > Travel & Outdoors > How Do Snowflakes Form? It takes a bit more than cooling clouds to form a snow crystal. Even though we see each snowflake as an individual element, its development involves a rapid and sensitive interaction of water molecules responding to the forces of wind and temperature. Each intricate snowflake is amazingly complex in its distinctive six-branched symmetry. What are the origins of these elaborate designs, and why do snowflakes form in such varied, symmetrical shapes? How is it that the clouds command such artistry? 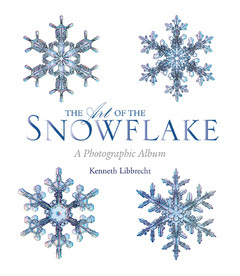 Kenneth Libbrecht, author and photographer of The Art of the Snowflake, takes readers through the beautiful process of a snow crystal’s creation. Even though we see each snowflake as an individual element, its development involves a rapid and sensitive interaction of water molecules responding to the forces of wind and temperature. The story of a snow crystal begins with the water that evaporates from lakes, forests, and oceans. Water vapor joins the air and is carried over great distances by the wind. If a parcel of warm, moist air happens to cool down, the water vapor it contains can condense onto ever-present dust particles in the air, forming tiny water droplets. The effect is essentially the same as when water condenses as dew drops on the grass when the evening air cools. The drifting clouds are nothing more than countless water droplets suspended in the air, each having formed around a minute speck of dust. If a cloud cools enough, some of its constituent droplets will freeze. At the atomic level, freezing causes the water molecules to abandon their disordered liquid structure and connect together to form a solid latticework. Each molecule is obliged to attach just one way to its neighbors, resulting in a structure where all the molecules are precisely oriented with respect to one another. In the case of ice, this produces a hexagonal lattice because of the specific geometry of the water molecule; this molecular construction is what underlies the symmetry seen in snow crystals. When a cloud droplet first freezes, it retains its roughly spherical shape, with little symmetry in its outward appearance. As more water vapor condenses onto the ice surface, however, the crystal grows and its hexagonal destiny begins to emerge. The condensing molecules do not attach at all locations with equal likelihood. Chemical forces attract molecules to spots with the most dangling bonds. The molecular rows and columns tend to fill in before new rows and columns are added. With time, this yields faceted surfaces on the crystal, and the orientation of the different facets reflects the underlying lattice structure. This process is how the geometry of the water molecule ultimately guides the symmetry of a large snow crystal. Faceting tends to dominate the growth dynamics when crystals are small, so the tiniest snowflakes are likely to have a simple hexagonal shape. As a snow crystal grows larger, simple faceted growth becomes impossible. The corners of a hexagonal crystal stick out farther into the humid air, so they tend to accumulate more water molecules and grow out a bit faster. The extra growth causes the corners to stick out even farther, which again increases their growth. There is a positive feedback effect, and soon six branches sprout from an initially hexagonal crystal. As these grow larger, the same process can yield side-branches on each of the main branches. Once branches and side-branches appear, their subsequent growth is very sensitive to the temperature and humidity surrounding the crystal. Even a slight change in its local environment causes a change in the way the crystal grows. As it blows to and fro inside a cloud, a developing snowflake sees ever-changing conditions, so its final structure can be quite complex. And since each crystal follows its own unique path as it grows and descends, each arrives at the ground with a unique shape. But while different snow crystals follow different paths through the clouds, the six branches of a single crystal travel together. They all experience the same growth history, so they grow in synchrony. The end result is a snow crystal that is both complex and symmetrical . . . and often quite stunning. By considering the path of a single snow crystal, we see that its structure is not designed or predetermined in any way, but results from the random path it followed through the clouds as it grew. The arms are not synchronized by any mysterious force, but grow independently under nearly identical conditions. The unruly whorls and eddies in the air drive each snowflake through a chaotic, convoluted path as it grows, resulting in a great diversity of final patterns. In this way, the wind becomes the artist, creating a multitude of unique ice sculptures using only the simplest of raw materials. Given this picture of how snow crystals develop, one can estimate how many different structural variations are possible for a large, branched snowflake. The number is almost unfathomably large—so large, in fact, that I can say with confidence that no two complex snow crystals have ever been, or ever will be, exactly alike. The perfect geometry and exquisite beauty of nature is nowhere near as clear to us as in the snowflake. As miraculous a feat of nature as the snowflake is, have we ever been truly able to appreciate this infinitesimal wonder in all its crystalline glory? Art of the Snowflake, as much a work of art as a testament to science, reveals how one of the snowflake’s most inspired photographers came to such intimate knowledge of his craft and its fleeting focus. Beautiful pictures illustrate Kenneth Libbrecht’s story of the microphotography of snow crystals, from the pioneering work of Wilson Bentley in the 1890s right up to Ken’s own innovations in our age of digital images. A breathtaking look at the works of art that melt in an instant, this is a book to flip through and savor, season after season. Greet New Year’s Eve Party Guests With Washi Tape!